It’s time for an official 12 Day GoodBelly Reboot! And to help motivate you on the path to digestive wellness, we hosted a blogger recipe contest for GoodBelly Smoothies. The seven entrants fired up their blenders to create the incredible recipes below. Each one takes mere minutes to make, and is loaded with probiotics and other nutritious goodies. But before you get blending, sign up for the GoodBelly Reboot! Although the official event starts today, it’s always open for you to start any time. The quick sign up opens a portal to helpful tummy taming information, support, and a generous coupon! Like autumn in a glass, this creamy blend hit all the right notes with a satisfying mix of spice, pumpkin, and fruit. We used a frozen banana for more of a shake-like experience. But if bananas are out, I recommend skipping the banana and doubling the pear. Surprisingly, the flavor of this smoothie also works well with the Lemon Drop StraightShot. It adds a little brightness to the finish, but is mild enough to let those fall flavors shine. These are all winning recipes in my book! It was insanely hard to single out a recipe since all of these GoodBelly smoothies are truly delicious. I can’t fault any of them, and have included my notes on why we love each one. 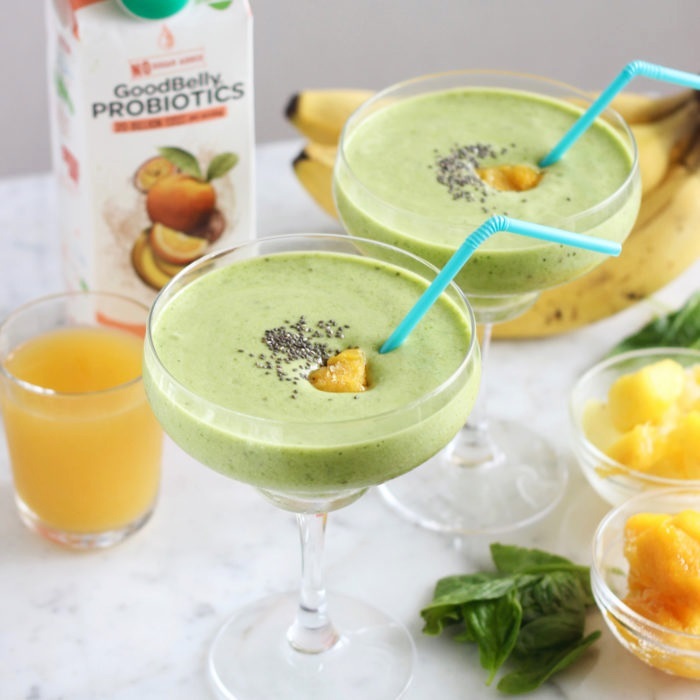 This healthy frosty recipe tastes just like an Orange Julius! But you won’t believe the key secret ingredient. 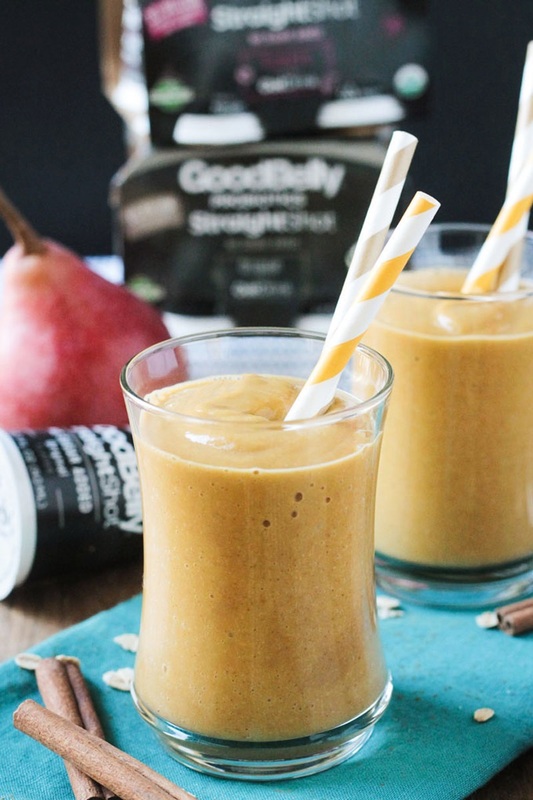 This banana-free blend sneaks in loads of nutrition and is seriously low sugar. I added just 2 drops of stevia and didn’t need much ice for a sweet refreshing flavor that was spot on. This blend doubles down on the blackberry goodness and also contains pomegranate and blueberry for a sweet-tart treat. It’s kid-friendly and approved by this adult. The deep red-purple hue hides the handful of greens within and a touch of Omega 3 adds a hint of richness. Meme owns the spinach color in this green smoothie, but the flavor is sweetly tropical. 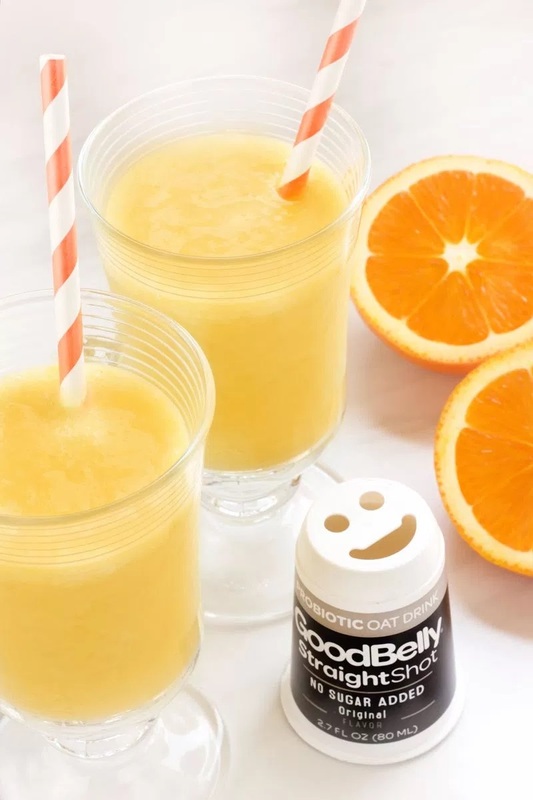 It’s a synergistic combination of mango, banana, and pineapple blended with GoodBelly Tropical Orangeade, naturally. Time to head to the cabana. 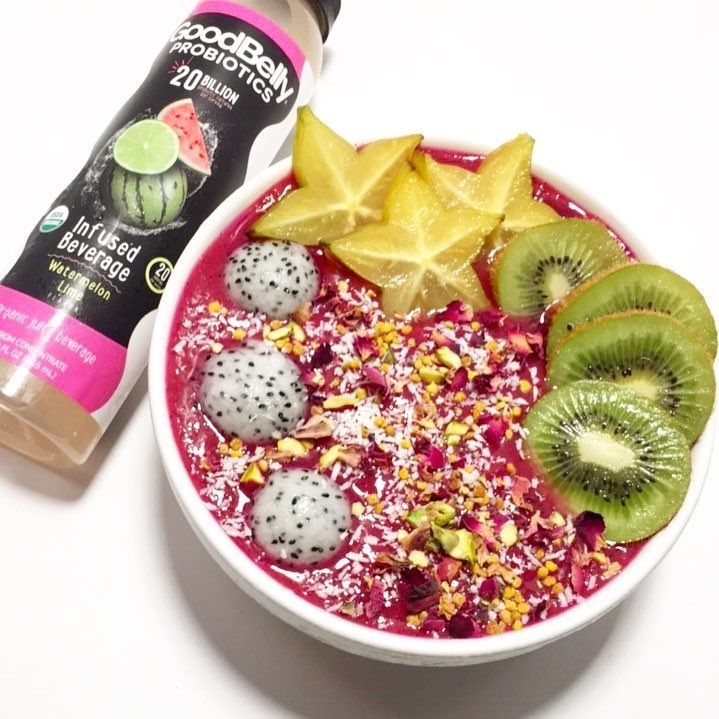 I never said you couldn’t enjoy GoodBelly smoothies in a bowl! Sarah shows two options for her recipe. The bright pink one is the original, made with dragon fruit (pitaya), which you can buy fresh or frozen. The other uses acai or blueberries, just in case you can’t find dragon fruit. Either way, this bowl is fresh and fruity with a sweetness that suits breakfast or an afternoon treat. 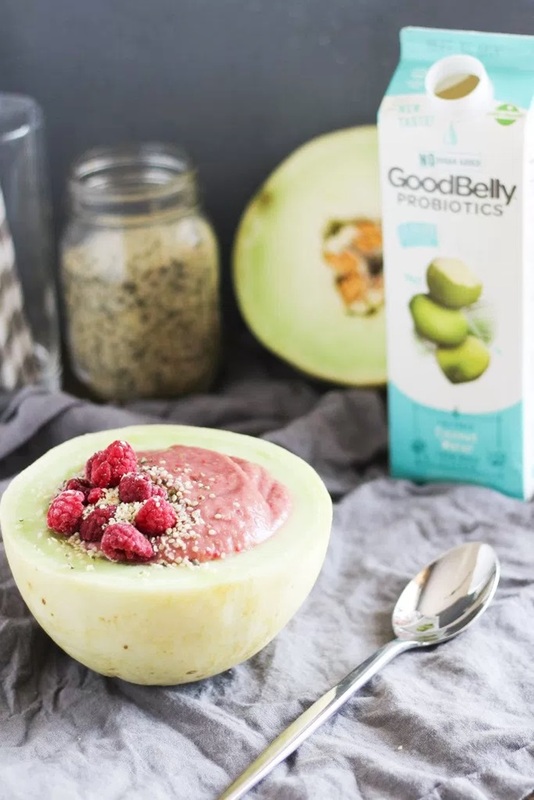 Using a half melon for a smoothie bowl is pure genius! We loved the magical combination of sweet-tart raspberries and ripe melon. The avocado adds creaminess and the Cultured Coconut Water ties it all together for a refreshing finish. My smoothie bowl wasn’t as celestial and pretty as Tara’s, but it still tasted darn good. I’d call this one the “all in” smoothie with 8 fruits represented! If you can’t find dragon fruit powder, pomegranate powder is a nice alternative and adds a touch of tartness. This recipe contest was sponsored by GoodBelly Probiotics. All GoodBelly products are dairy free and provide a tasty way to digestive wellness. I enjoy them myself regularly! 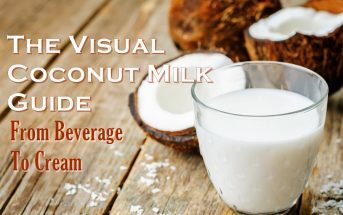 You can enjoy their traditional Probiotic Juice Drinks, Gluten-free Probiotic Juice Drinks, Cultured Coconut Water, single-serve PlusShots, no sugar added StraightShots, high-powered SuperShots, or new Infused Beverages. 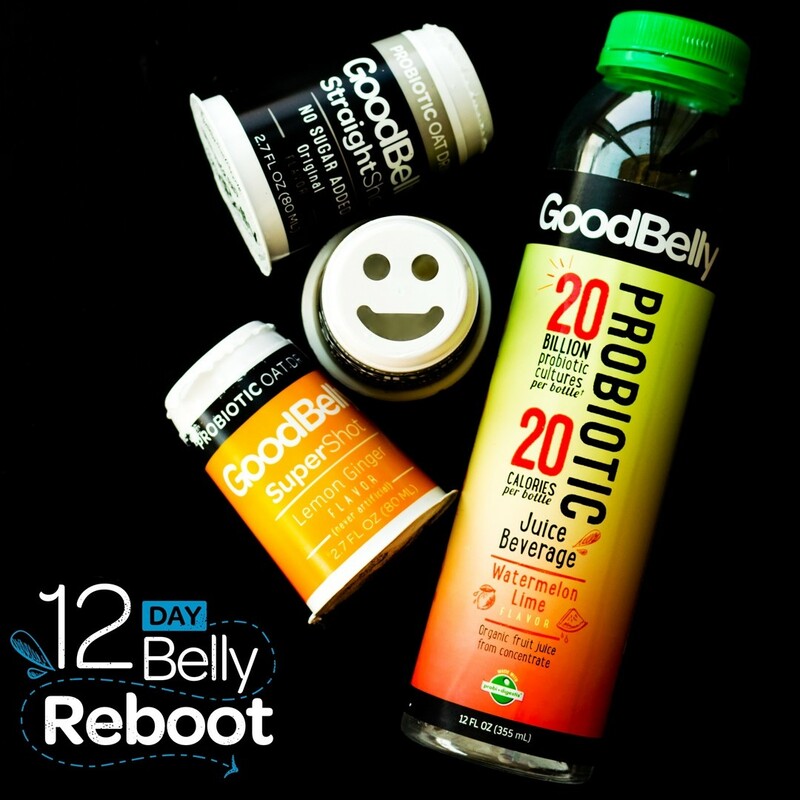 See the entire line-up of GoodBelly Probiotic Drinks and sign-up any time for their helpful 12-Day GoodBelly Reboot. It includes tips, support, and usually coupons so that you can enjoy all of these GoodBelly Smoothies! I haven’t tried GoodBelly, I really should. All of these smoothies look so delicious, and I love that they have the extra health benefits of probiotics. You definitely should! 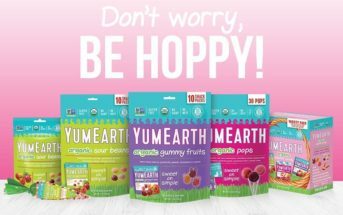 People are always surprised by how good they taste and the affordability compared to comparable probiotics. I really wish I could find Goodbelly in Germany. These sound like something I would enjoy! SO many yummy smoothies to try! I really need to incorporate probiotics into our family’s lifestyle! I think we would all benefit greatly from it! From what I’ve read, I think everyone would! Can’t wait to try it, love me some pumpkin 🎃! You and me both Nancy. These all really are sensational! And I did pick some goodbelly up so I can’t wait to try these! Congratulations Jenni!! What an interesting combo that sounds so good! I can’t wait to try it. These smoothies look so good! I want them all! This is a great idea – I definitely need to look at my probiotic intake! These smoothies all look so mouthwatering. It’s so hard to remember all of these health extras, but I’m focusing more on probiotics, too, Trinity. 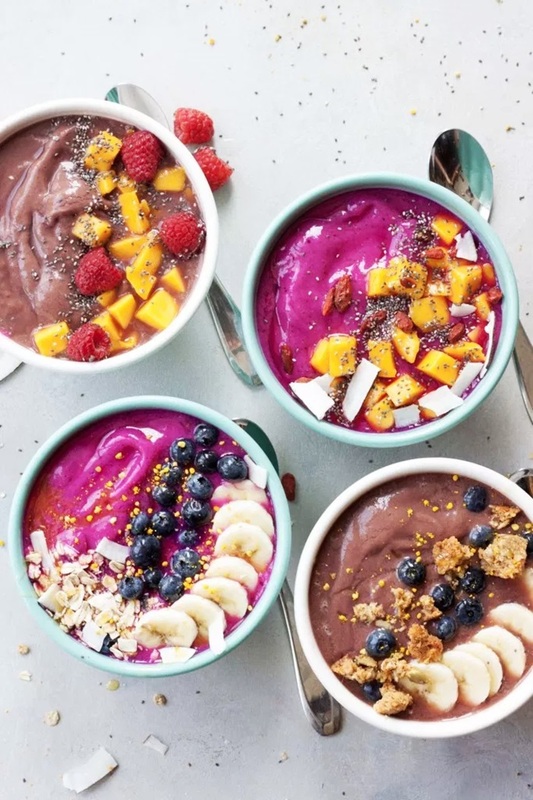 That mango dragon smoothie bowl is calling my name! These look SO delicious! You must try it Christine – it’s SO good! All of these recipes look amazing! It must have been difficult to pick a favorite. Congrats to Jenn! You have no idea Dianne. No lie – every single smoothie is delicious!! 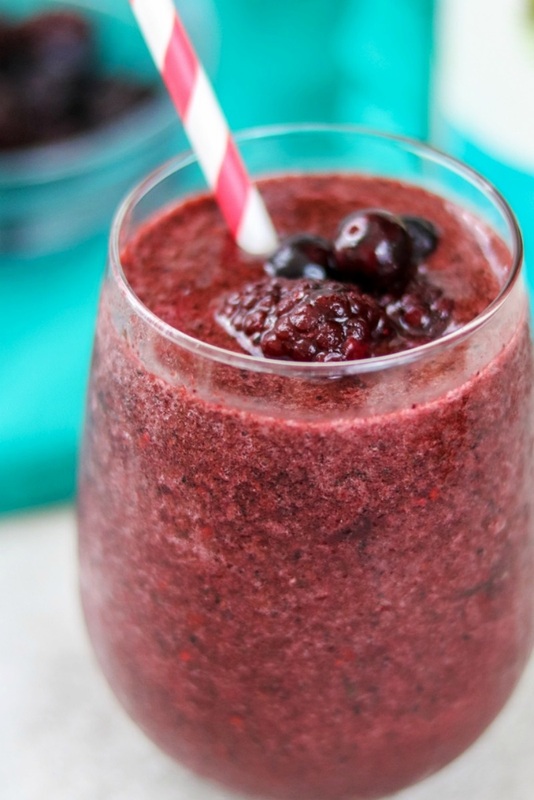 Such an amazing round up of smoothies! I wish I’d entered the contest! Love the sounds of this stuff..can you find it in Canada? You know, I’m not sure if they are in Canada yet Deryn. Let me find out! OMG!!!! I’m so excited right now! Thank you so much, Alisa!! I’m so happy you guys loved it so much too. And I love the suggestion of using the lemon drop shot too – that would brighten it up in a lovely way. Thanks again for this opportunity!